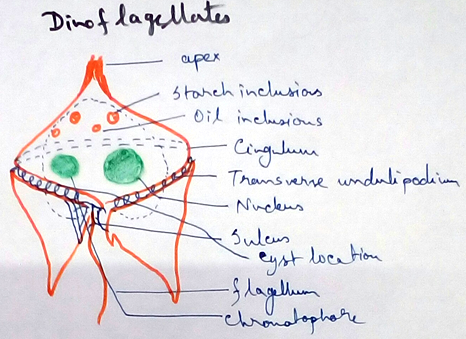 I. Zooflagellata: it includes the protozoans which have flagella for locomotion. The cell is covered by periplast. Holistic or absorptive nutritions are observed. Lobopodia – broad pseudopodia observed. Filopodia - narrow pseudopodia are observed. Axopodia - narrow with support pseudopodia is observed. Reticulopodia - reticulate pseudopodia is observed. Sarcodina can be solitary or colonial, with or without a shell, uninucleate, binucleate or multinucleated. Holistic nutrition is observed.Excretion is amonotelic. It consists of ameboids, heliozoans, foraminifera’s and radiolarian. A. Amoebids - body shape is changeable. Food capturing and locomotion are performed by lobopodia.e. g. Amoeba, Entamoeba, etc. B. Heliozoans - The protists posses radiating axopodia-.e. g actinophrys. C. Foraminiferans – The bottom dwelling sarcodines have one or more chambered calcareous shell with extra capsular protoplasm giving rise to reticulopodia. White chalk of cretaceous, Egyptians pyramid, limes of eosin are foraminiferans by origin. E.g. Elphidium, Globigerina etc. D. Radiolarians – Free floating sarcodines are large sized and multinucleated. Chromosome number is high, as Aulocantha possesses the maximum number of chromosome, 1600. Radiolarians have siliceous perforated capsule. Intracellular capsular part has nucleic and vacuoles. Extracellular part consists of pseudopodia (filopodia-axopodia or reticulopodia). E.g. Acanthoamoeba, Callozoum. III. 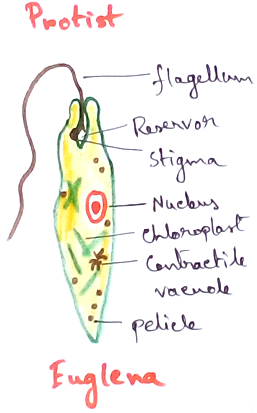 Cilliata: The protists have numerous cilia, a pellicle, regions of ingestion and version and nuclear dimorphism (reproductive micronucleus and vegetative macronucleus). A few forms are sedentary or colonial. 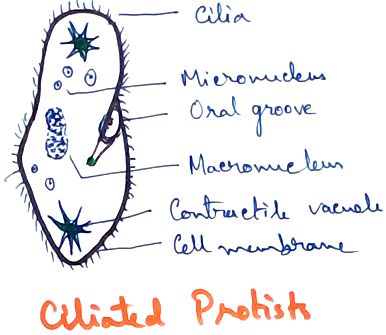 Ciliates are fastest protists with a maximum speed of 2mm/sec. It is 1mm/sec in paramecium.It contains trichocyst and cillia. Vorticella is stalked ciliates found attached to various objects inside fresh water ponds. Stalk is contractile. The body is like an inverted bell thickened on the rim to form collar or lip. Paramecium is free living fresh water ciliate which is popularly known as slipper organism. V. Parasitic protozoans: they are also called sporozoans. They are spore forming protozoans. It lacks locomotory structures and contractile vacuoles. The body is covered by pellicle or cuticles.Plasmodium vivaxis malarial parasite spread by female anopheles mosquito. Life cycle of Plasmodium is cinematic and triphasic (schizogony, gamogony and sporogony). Acanthoamoeba- Cyst forming parasite in pharynx and brain, causing necrosis, keratitis, abscesses and meningo- encephalitis. Dientamoeba- D.fragilis is a noncustodial forming parasite of large intestine that develops abdominal discomfort and diarrhoea. Cryptosporidium- A minute Cyst forming intestinal parasite that also passes to trachea or bile duct causes diarrhoea. Sarcocystis- A sporocyst forming protozoans that produces vomiting and diarrhoea. Naegleria – Cyst forming protozoans that may attack brain and cause meningoencephalitis. 1. Who is the biological primary host of Plasmodium? 2. Which organism causes kala-azar? 3. What is responsible for producing Chagas' fever in children? 4. What is the cause for development of amoebic dysentery? 5. What was the first drug used for malarial treatment and what was origin? Quinine was the first drug used for treatment of malaria and it is collected from the bark of Cinchona.